Yesterday, while installing a Package, a beekeeper in Portland felt certain a Small Hive Beetle, SHB, accompanied the mix. Our honey bees have been devastated by the Varroa Mite over the past years, but with the emergence of the small hive beetle we enter into a new era of concern and control. 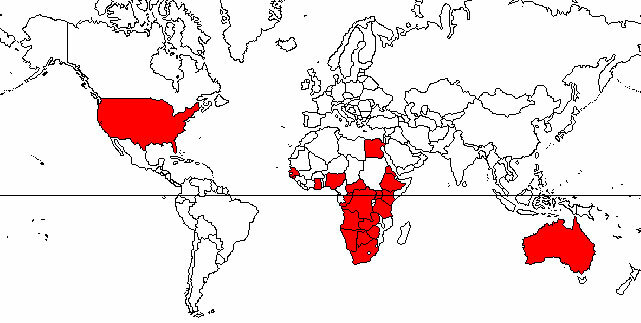 It has slowly been moving from South American through the Southern States of America toward the North. Keep bee colonies healthy and strong. There are other beetles which may inhabit the hive, yet are not significant or damaging as the Small Hive Beetle. The SHB is native to sub-Saharan Africa where it is an occasional pest in colonies of African subspecies of the western honey bee. Newly emerged adult small hive beetles are light brown, becoming progressively darker (almost black) as their exoskeleton sclerotizes (hardens). These color changes may occur in the pupal cell before the adult emerges. 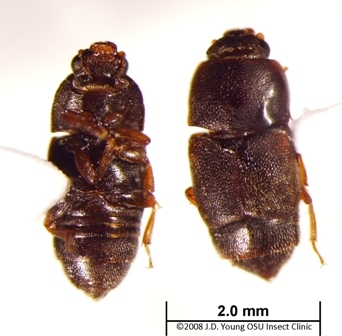 Adult female (5.7 ± 0.02 mm) small hive beetles generally pupal cell before the adult emerges. Adult female (5.7 ± 0.02 mm) small hive beetles generally are longer than males (5.5 ± 0.01 mm) but both are nearly identical in width (about 3.2 mm). Adult females (14.2 ± 0.2 mg) are also heavier than males (12.3 ± 0.2 mg) and occur in greater proportions of the population. Naturally occurring small hive beetles can vary greatly in size, possibly depending on diet, climate, and other environmental factors. It is easy to read a book or watch a YouTube video, but see with your own eyes, touch, smell, or feel differing issues surrounding our honey bees cannot be replaced. Toward the end of our visit to the National Honeybee Laboratory in Beltsville Maryland, Dr. Fernando Vega, entomologist, brought out a tub with a frame devastated by the Small Hive Beetle. You will note the pollen cells appear liquid rather than the typical solid presence. Toward the upper left quadrant is a cell with a ‘burst’. This would be the Small Hive Beetle exiting its cell. When spotting a larvae in your hive the challenge becomes – “what is it?” Typically it becomes a choice between the SMB and the Wax moth larvae, which have similar larvae appearance. 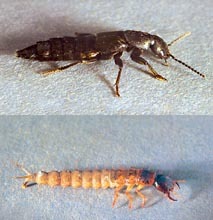 The small hive beetle larvae are off-white in color and grow to a length of about ½ inch (approximately 10 to 12 mm). They are similar in appearance to the greater wax moth larvae (Galleria mellonella) and hence may be confused with them. Both have three pairs of well-developed legs on segments behind the head, but the SHB larvae can be distinguished by the absence of modified appendages, called prolegs, past the third segment (Figure 4). 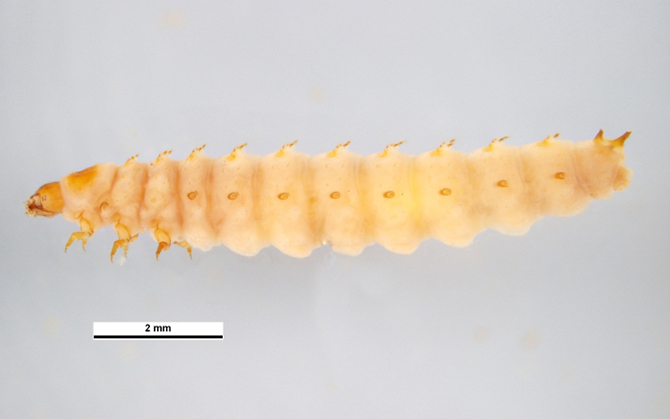 However, greater wax moth larvae (Figure 5) have prolegs on the third through the sixth body segments. 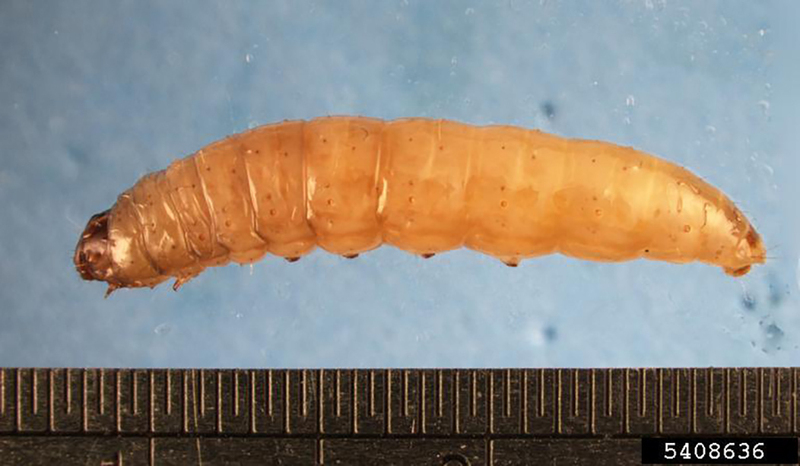 SHB larvae have numerous dorsal spines, which wax moth larvae lack. SHB larvae produce slime, whereas wax moths have silken protective webbing. Although not fully known, small hive beetle biology is becoming better understood (Ellis and Hepburn 2006, Hood 2004). Upon emerging from the ground (where they pupate), adult small hive beetles search for honey bee colonies, probably identifying the host colony by a suite of olfactory cues. Investigators have shown that small hive beetles fly before or just after dusk and odors from adult bees and various hive products (honey, pollen) are attractive to flying small hive beetles (Elzen and Neumann 2004). Some investigators have suggested that small hive beetles also may find host colonies by detecting the honey bee alarm pheromone (Elzen and Neumann 2004). Additionally, small hive beetles carry a yeast (Kodamaea ohmeri) on their bodies that produces a compound very similar to honey bee alarm pheromone when deposited on pollen reserves in the hive. Upon locating and entering the host colony, adult small hive beetles seek out cracks and crevices where they hide from bee aggression. These locations are often referred to as ‘prisons’ (Ellis 2005). Remarkably, honey bees station guards around the prisons where small hive beetles hide. The ‘prison guard’ bees keep the small hive beetles confined to the cracks and out of the brood combs where there is an ample supply of honey, pollen, and brood on which small hive beetles reproduce. 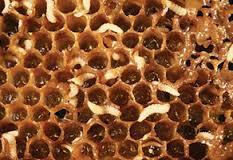 Small hive beetles do not starve in these prisons as they are able to solicit food from their bee captors. In this behavior, small hive beetles use their antennae to rub the bees’ mandibles and induce the bees to regurgitate. 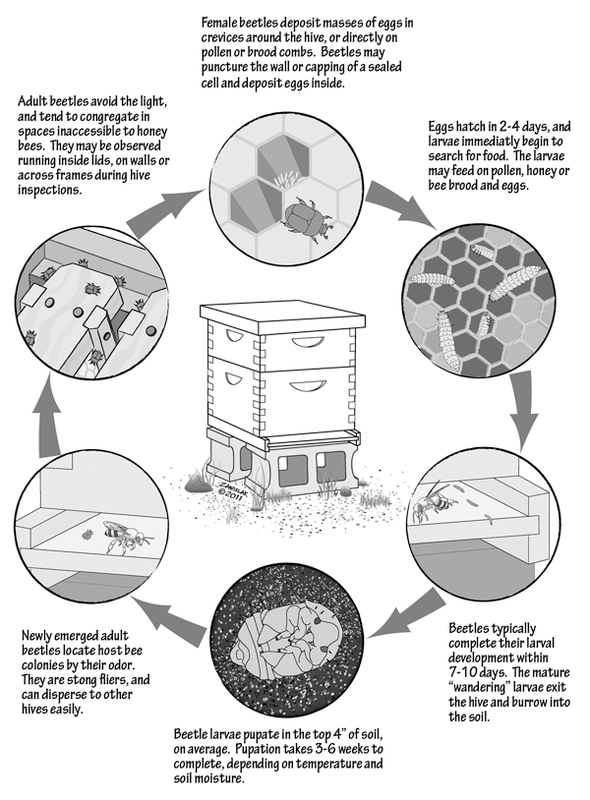 Small hive beetles then feed on the regurgitated food (Ellis 2005, Ellis and Hepburn 2006). 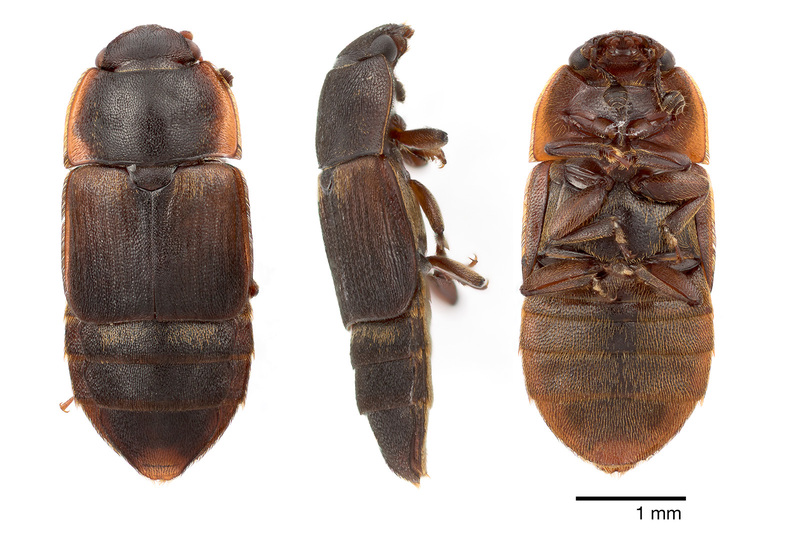 Mating behavior of small hive beetles (including whether female small hive beetles mate once or multiple times) is not understood, but adult small hive beetles do not appear to be sexually mature until about one week post-emergence from the soil. If allowed to reproduce, female small hive beetles will oviposit directly onto food sources such as pollen or brood combs. Alternatively, female small hive beetles may deposit irregular masses of eggs in crevices or cavities away from the bees as female ovipositors are long and flexible, being perfectly designed to lay eggs in tiny and concealed places. A female small hive beetle may lay 1,000 eggs in her lifetime, although data suggest that the number of eggs produced in one female’s lifetime might be upwards of 2,000 (Hood 2004). The majority of these eggs hatch within three days; however, some eggs are still viable and hatch after five days. Humidity appears to be a crucial factor influencing hatch rates as small hive beetle eggs are prone to desiccation if exposed to circulating air and relative humidity below 50%. Newly hatched larvae immediately begin feeding on whatever food source is available, including honey, pollen, and bee brood, though they have demonstrated a preference for bee brood. Maturation time for larvae is generally 10-16 days although some may feed longer than a month. Once the larvae finish feeding, a wandering phase is initiated where larvae leave the food source and migrate out of the colony to find suitable soil in which to pupate. It is believed that the majority of larvae do this at night in the cover of darkness (Ellis and Hepburn 2006). Larvae in the wandering stage may wander great distances from the hive to find suitable soil. 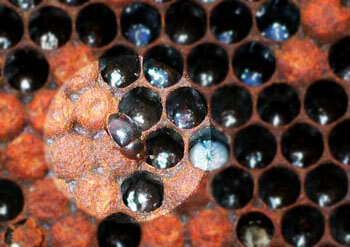 Despite this, most larvae pupate within 90 cm of the hive. Nearly 80% of the larvae burrow down into the soil less than 10 cm from the soil surface but not generally more than 20 cm. Once larvae cease burrowing, they construct a smooth-walled, earthen cell in which they pupate. The period of time spent in the ground pupating can vary greatly depending on factors such as soil temperature, moisture, and composition. However, the majority of adults emerge from the soil in approximately three to four weeks. Upon adult emergence, the entire life cycle begins again. The turnover rate from egg to adult can be as little as four to six weeks; consequently, there may be as many as six generations in a 12-month period under moderate climatic conditions.